Cape Ann is the bulge of land north of Boston on which Gloucester is the largest city and one of the oldest functioning seaports in the New World. This area is studded throughout with a wealth of granite, mainly boulders and short cliffs. Tucked away in the woods of Gloucester, Essex, Manchester-by-the-Sea, Marblehead, Peabody, Lynn, and other towns are few-and-far-between bouldering destinations and cliff bands with high quality routes on exquisite, bulletproof New England granite. In this subarea, we will only have Cape Ann crags. Drive north from Boston on I-93 to the junction of I-95 and Route 128. Peabody bouldering exists right at this junction of highways. All destinations in Gloucester and other neighboring towns straddle Route 128 after its divergence from I-95 as it heads toward Gloucester. To avoid difficulty in finding perhaps the best known of the Cape Ann crags, Redrock, this particular crag has been left out separately under the general Massachusetts page, since some climbers, even locals, do not necessarily think first to look under Cape Ann when looking for Redrock. Unknown slabby wall in Cavalry Area (east of Red Rock). Anyone ever climbed this little slabby wall? It's located in the Cavalry Boulder Field area (across from Red Rock). It's visible on the topo as the large rocky outcrop near the Orange path after the Orange and Green Paths separate. It's not huge but has potential for a route or two. My parents moved to Rockport a few years ago, and I've been in town a couple times. After a bit of exploration, I discovered a few top rope anchors above a slab at the one of the Lanesville Pits. Anybody know anything about these climbs? I'm planning on checking it out when I return this November. The routes are probably 20-30 feet on what looks like pretty low angle slab, as I remember, so nothing to get too excited about. It also occurs to me that there could be top rope potential for some longer routes on the walls at a few of the quarries. Not to mention soloing on the quarry walls! One of the Lanesville Pits (northeast?) has a wall which is more than 40 feet. I was also told of a third pit with a 75 foot wall, but I wasn't able to find it. It may also be possible to access the walls by traversing above the water from near the bottom, but I didn't look closely. Also, presumably people have bouldered on some of the numerous boulders in Dogtown Commons, but there isn't any information here. From previous posts, I'm led to believe that everything climbable on Cape Ann has been climbed. It would be nice to preserve some of the history, which is only possible if it's documented! I was looking for info on some boulders in Peabody when I came across this eccentric site. 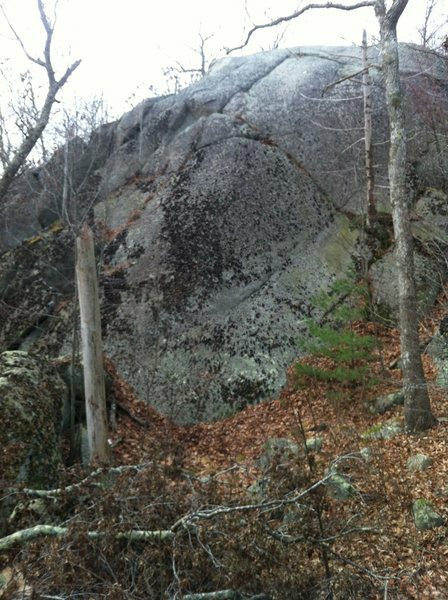 Among the many pages of random rock related pictures, there are several interesting ones of large erratics and good-looking outcrops on and around Cape Ann and Essex County in general. Most are historic shots. Many of these are probably known about by some boulderer, but if anyone is bored or motivated (the two are often same thing) and wants to find some new stone to climb dig through these images. You might find something cool. Hey Jim - Great Link! He mentions the House and Barn boulders in this link, and I found another link about them that says there are even more in the Westford Woods. Anyone know more? I've mapped many of the Cape Ann areas and have just started mapping individual boulders within the Gymnasium/Great Swamp area as well as Dogtown. 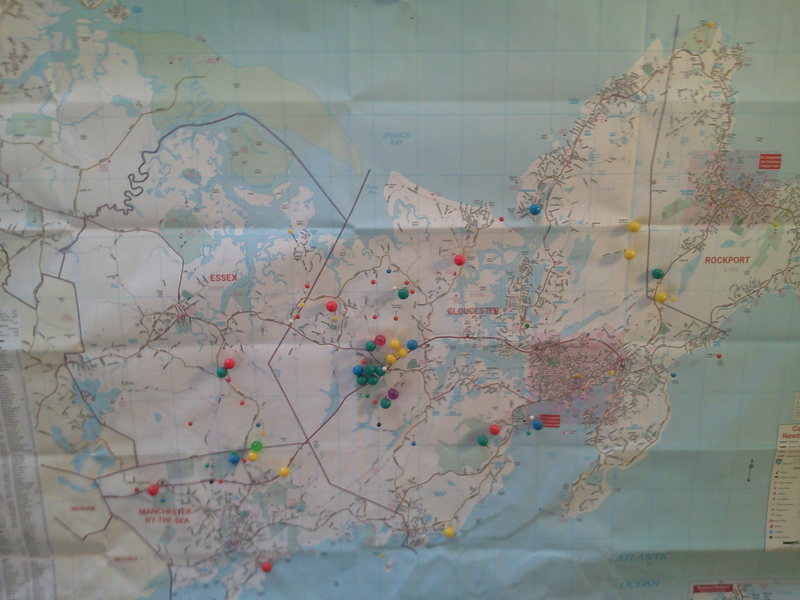 If you'd like to contribute to the map, let me know.